“Speedway Motorsports works very hard to continually modernize our facilities, with the ultimate goal of providing fans with the very best amenities and experiences,” said Marcus Smith, President and CEO of Speedway Motorsports. “We are privileged to roll out the newest additions to our ongoing ‘Fans First’ initiative in what we believe will give our fans the most spectacular ways to enjoy the unforgettable entertainment at our multi-purpose sports venues,” Smith concluded. 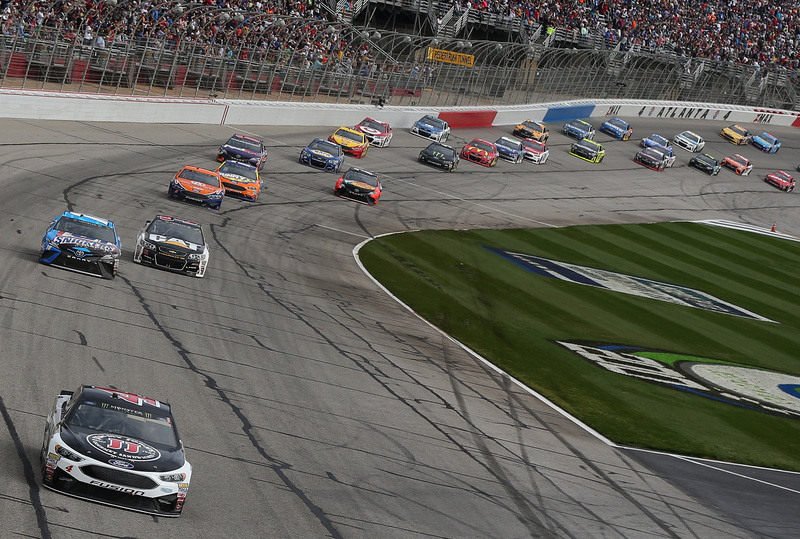 Race fans seeking an up-close look at on-track drama from a spectacular vantage point will get their chance at Texas Motor Speedway and Atlanta Motor Speedway. Texas Motor Speedway’s Restart BAR Zone Club, located 26 rows above the restart zone at the start of the frontstretch dogleg area, gives race fans a new way to experience the April 8 O’Reilly Auto Parts 500, June 9 Texas Indy 600 and the Nov. 4 AAA Texas 500. The new entertainment area will feature indoor and outdoor lounges to give fans the outside adrenaline rush of racing and the comfort of climate-controlled, indoor socializing. Atlanta Motor Speedway’s multi-purpose Restart Bar – situated 20 rows above the track surface in the frontstretch Earnhardt Grandstand – offers fans a tremendous view of the speedway for the Feb. 25 Folds of Honor QuikTrip 500 as well as other speedway events. With accommodations for up to 300 fans, Atlanta’s Restart Bar also includes indoor and open-air seating as well as a bar, high-top tables and space for interactive games and activities. For further details about the new Restart Bars or to purchase event tickets, fans should visit www.atlantamotorspeedway.com or www.texasmotorspeedway.com. The newest additions to Las Vegas Motor Speedway’s fan experience promise to be some of the speedway’s most spectacular enhancements in its illustrious history – which this year includes becoming the first NASCAR track to host two tripleheader weekends of Camping World Truck, Xfinity and Monster Energy Cup Series races. Fans will have multiple ways to witness the high-octane excitement of the March 4 Pennzoil 400 presented by Jiffy Lube and the Sept. 16 South Point 400 in VIP fashion. Enhancements include three completely renovated, exclusive clubhouse areas; two separate loge-box seat offerings and a racing-inspired, interactive sports lounge. Additional amenities such as Neon Garage access, personal wait staff, complimentary wireless internet, premium parking and more are available with different access packages so that fans can enjoy life in the fast lane at Las Vegas Motor Speedway. 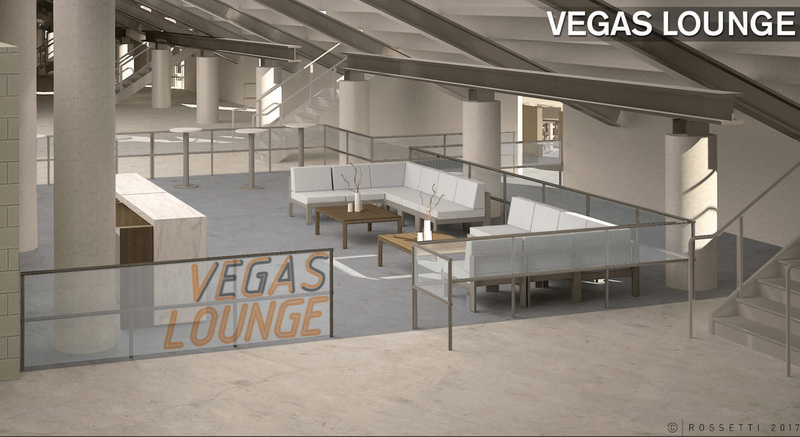 For more information about Las Vegas Motor Speedway’s new hospitality experiences or to purchase event tickets, fans should visit www.lvms.com. At 17 turns and 2.28 miles, Charlotte Motor Speedway’s revolutionary Roval course layout will thrill fans when the Sept. 28-30 Bank of America 500 race weekend roars to life. Drivers and teams will be tasked with overcoming the literal and figurative highs and lows of the Roval course as they pursue a monumental victory in the first road course race in NASCAR’s playoff history. 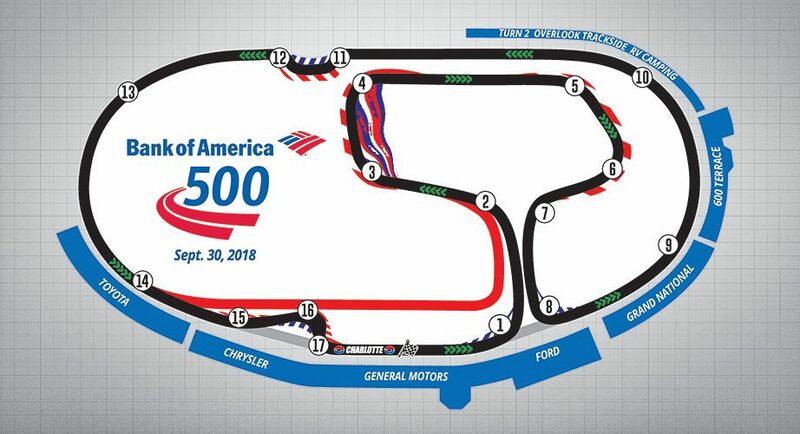 The Bank of America 500 will see drivers competing on a faster infield layout that features a daunting, 35-foot elevation change from the course’s lowest point – Roval Turn 4 – to its highest, Roval Turn 9. Speedway officials have reconfigured Turn 8 to create a straighter exit from the infield onto Charlotte’s iconic 1.5-mile oval. The course enhancement will provide more passing opportunities, a welcome sight for teams looking to advance in the NASCAR Playoffs while entering the record books as the first winners in Charlotte Roval history. The innovative Roval layout also features frontstretch and backstretch chicanes for drivers to navigate, further bolstering the Roval’s unsurpassed spectacle of speed, strategy and playoff drama. For more information about the history-making debut of the Roval course at Charlotte Motor Speedway and to purchase tickets, fans should visit www.charlottemotorspeedway.com.